The sixth stage of Abans’ ‘Suhuru’ CSR initiative took place in September at the Abans Head Office. Dedicated towards presenting deserving students with a laptop of their own to achieve their academic goals, the event represents the Company’s overall aim of ensuring that every child from every socioeconomic background receives a worthy education. “Technology blended education is the key to developing skills and talents that the country needs in the future. Helping our young talent with devices which transform them into global students is of the utmost importance in today’s context. So, it is our responsibility to invest more in enhancing Sri Lanka’s educational standards,” said Abans PLC General Manager Chathura Jayawardena, remarking on the significance of the occasion. In Sri Lanka, there are currently thousands of talented students whose ideas and minds have the potential to contribute significantly towards the economy. Yet, they lack the financial or social resources to engage in an academic career that will enable them to put their natural skills to use. To alleviate this issue, the Board of Directors of the Abans Group launched the ‘Suhuru’ CSR initiative centred on helping underprivileged students excel in their education, which in turn enables them to experience a future that will benefit Sri Lanka as a whole. 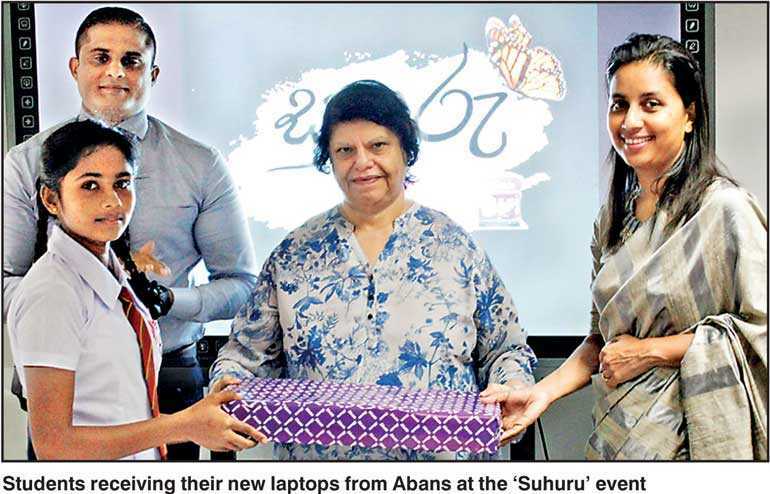 Under the ‘Suhuru’ CSR initiative, Abans has made significant progress towards accomplishing their goal by facilitating the distribution of laptops to low-income students across the country. Students, from the ages of 14 to 21, were given the chance to write to Abans on how a laptop would assist them in their education. Then, the students Abans deemed the most deserving were gifted with the opportunity to receive a laptop. Each laptop provided by Abans offers durable hardware and advanced software features so that students can bridge the technological knowledge gap and utilise key tools in support of their education. From 2014 to present, more than 250 laptops have been donated through this CSR project, thereby giving students the ability to turn their dreams into a reality. Over the years, Abans has earned widespread recognition as Sri Lanka’s largest IT hardware retailer island-wide along with a reputation for making substantial investments in the local community. Abans is the market leader for IT, hosting the world’s best brands, such as HP, DELL, Acer and Lenovo. By launching ‘Suhuru’, Abans has taken a genuine step towards empowering the bright young minds that hold within them the potential to be future leaders of our nation.